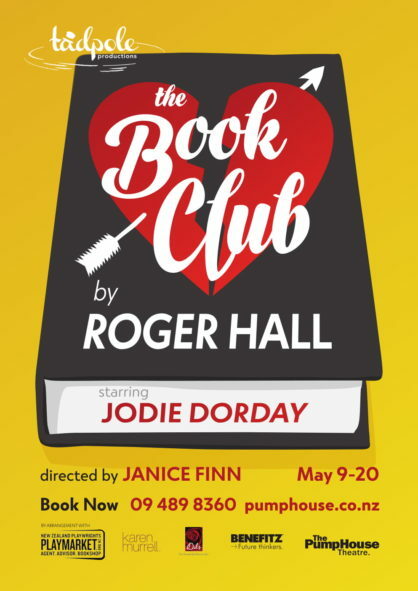 The Book Club is a romantic comedy written by Roger Hall, New Zealand’s pre-eminent playwright. The Book Club features a cast of just one actor, and Director Janice Finn has chosen Jodie Dorday for the role. The story is narrated by self-confessed book-a-holic Deb, who joins a book club after the children leave home. Through the book club she meets a diverse group of women, with a wide range of interests and opinions. The arrival of a local author at the book club turns Deb’s life upside down and makes for amusing and compelling entertainment. Following the matinee performance on Sunday 13th May there will be a PumpHouse Theatre Creative Talk with director Janice Finn and actor Jodie Dorday. Sunday 13th is Mother’s Day so this is the perfect opportunity to treat Mum to some top class theatre along with an enlightening and entertaining post-show chat. There’s also a special offer for Mothers on Mother’s Day! Bring your Mother along and receive 2 tickets for $60. We chat to Roger Hall and Jodie Dorday about their one woman show "Book Club"